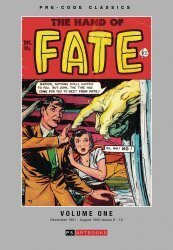 The Hand of Fate Volume One collects Ace magazine's comics issues 8-12 from December 1951 through August 1952. The creatives line-up from this veritable sleeper from the Ace magazine stable includes Ken Rice, Lou Cameron, Jim McLaughlin, Maurice Gutwirth, George Appel, Mike Sekowsky, Louis Zansky, Bill Molno and Chic Stone. A five-comic quintet that'll fool you every which way you turn. Digitally enhanced and faithfully reproduced. PS Artbooks. September 2018. Hard cover, full-color 174 pages. Shipping Note: This book qualifies for economy Media Mail shipping. However, if your order contains any items that do not quality (anything other than books, DVDs, or VHS. Magazines do not qualify because of the ads), you will need to choose a different shipping method, or we suggest you do a separate order.